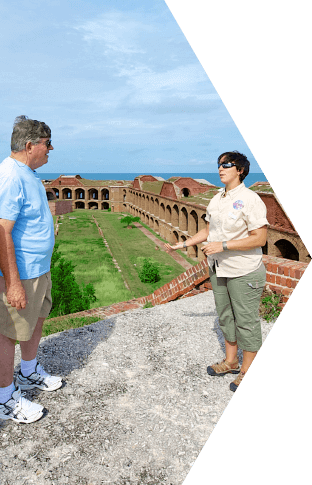 Yankee Freedom III passengers have the option of joining a 45- to 60-minute guided tour of the fort led by one of our expert naturalists. You’ll hear captivating stories about the fort, its remarkable history and its surroundings. 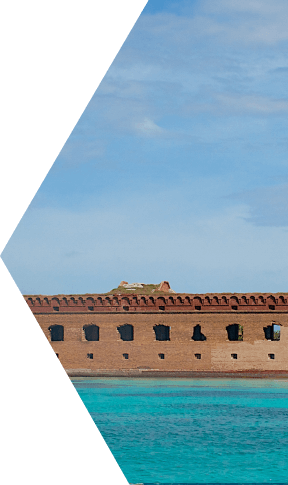 You can also download a self-guided tour of Fort Jefferson to print out or view on your cellphone or tablet as you explore. Click here to download the self-guided tour. The U.S. Army Corps of Engineers faced many challenges during the fort’s lengthy construction. Shifting sands, storms, and harsh conditions were common obstacles. The remote location hampered the shipment of supplies and skilled workers, especially during the Civil War. Meanwhile, sections of the fort started to sink. In an effort to limit the fort’s weight and slow subsidence, the second tier was intentionally left incomplete. Large quantities of brick, stone, cement, iron, and lumber were shipped here from around the United States. Most of the bricks were made in the Pensacola area, a four–day journey by sailing schooner. But when Florida left the Union in 1861, bricks could no longer be obtained from these brickyards. Instead they had to be shipped from as far away as Maine. These dark, red–colored Northern bricks are easily visible along the top of the fort’s walls. Casemates, or gunrooms, form the backbone of the fort. In essence, they are the fort. Large cannons mounted inside these rooms could fire through special openings known as embrasures. To construct these rooms, carpenters first built heavy wooden arches or frames. Next, skilled masons laid brick and mortar on top of the frames, creating the brick arches that are common throughout the fort. 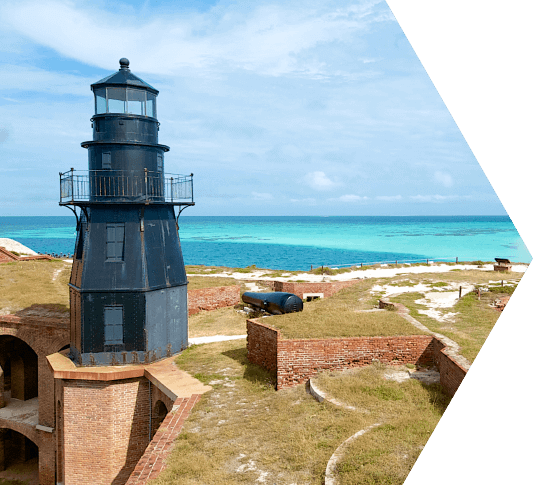 To protect the Tortugas Anchorage, Fort Jefferson featured some of the largest and most advanced weapons of its age. The fort’s largest guns, known as 15-inch Rodman smoothbores, weighed 25 tons a piece. With a crew of seven men they could fire a 432-pound projectile a distance of three miles. But advances in technology eventually made even these guns obsolete. Most of the fort’s guns were purchased in 1900 and removed by a Philadelphia scrap dealer. Nevertheless, several original guns still remain on top of the fort’s walls, left there, no doubt, due to their enormous size. Their new owner was unable (or unwilling) to move them! This once impressive building was designed to house ten companies of soldiers, or 1,000 men. More than a football field in length, the barracks were destroyed by a fire in 1912. By design, the fort’s gunpowder would be stored in 37 different magazines—spread out to reduce the risk of a catastrophic explosion and to make the powder more accessible. Thick walls kept dangerous sparks and flames out, while narrow openings allowed fresh air to enter (to help keep their contents dry). Five of the fort’s magazines were designed to be “detached,” free-standing buildings. Imagine standing on top of the fort’s walls—exposed to enemy fire—during a battle. Feeling a little vulnerable? Thick masonry mounds, or traverses, were designed to help protect men and guns along this exposed part of the fort. Small powder magazines were located inside the traverses. 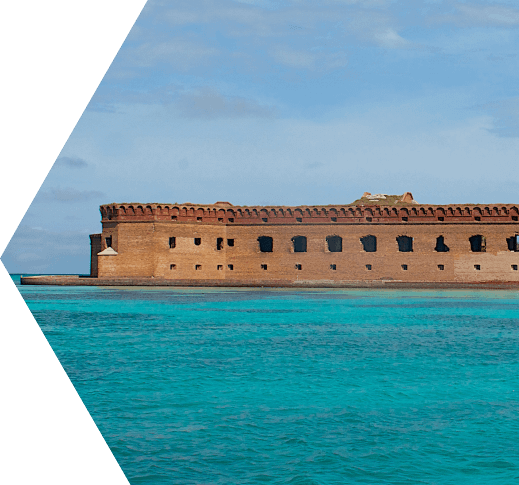 Start planning your Fort Jefferson trip today!